Protest over jailed anti-Muslim 'Identitarian' activist begins with speeches, but becomes a melee in the heart of the British capital. Five people were arrested, two for assaulting an officer, the Evening Standard reported, and five police officers injured, none seriously. At one point, police could be seen being chased down London streets by large crowds of angry, object-hurling protesters. At another, according to the Guardian, they blocked off a major road in London and engaged in protracted standoff with police. The subject of their rage — “free speech” martyr Robinson, the nom de plume of anti-Muslim/“Identitarian” activist Stephen Yaxley-Lennon — remained behind bars following his arrest May 25 for violating numerous court orders prohibiting him from covering criminal proceedings outside a Leeds courthouse. He is charged with potentially jeopardizing a just outcome in the trial, which involves so-called “grooming gangs” comprised mainly of Muslim defendants. His defenders, which include numerous right-wing activists in the United States, insist that Robinson has been unjustly imprisoned for attempting to use his “free speech” to shine a light on malfeasance by Muslim immigrants. The event began with a rally in Trafalgar Square where a number of speakers addressed the gathering crowd. These ranged from Dutch politician Geert Wilders to Anne Marie Watters of the For Britain movement to Breitbart News’ London bureau chief, Raheem Kassam, who in recent months has been increasingly linking Breitbart’s European coverage with the Identitarian movement. According to Hope Not Hate, Kassam’s speech referenced white-nationalist icon Enoch Powell. Among the protesters, according to Hope Not Hate, were members of Generation Identity, the white-nationalist “Identitarian” organization. When the speeches concluded, the protest became a march down Whitehall, with thousands chanting “Free Tommy!” However, the increasing interactions with police who lined the boulevard became intense and eventually violent. On one of the London side streets, a small phalanx of police found itself overwhelmed and could be seen beating a fast retreat to a larger boulevard, pursued by angry protesters hurling objects at them. Along Whitehall, people waving “Free Tommy Robinson” signs — as well as banners bearing such slogan as “Free Speech! Free Tommy! F-ck Islam!” — were seen hurling verbal abuse at police. 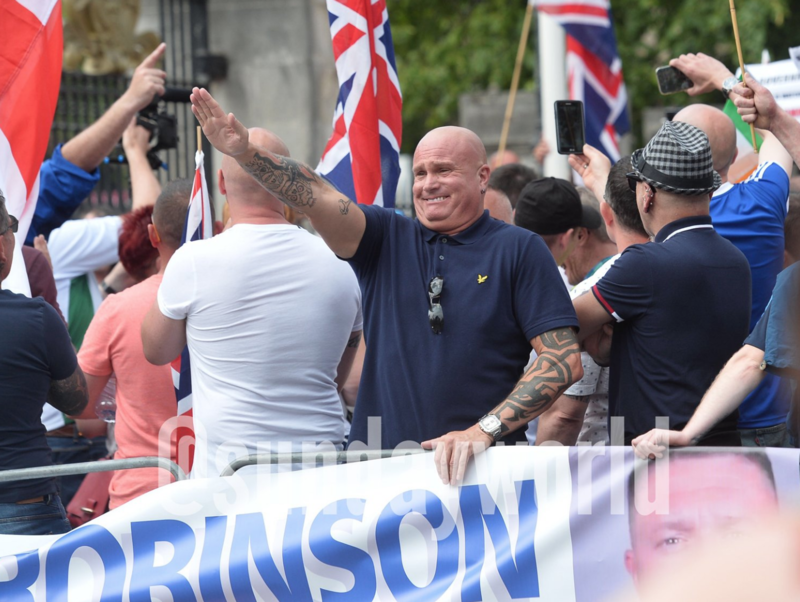 A protester in Belfast uses a Nazi salute, apparently directed at police. Courtesy Hope Not Hate. The same man was later recorded being handcuffed by police at another location, bitterly complaining that police were hurting him as they held his arms. It was not clear if the man was arrested. According to the Guardian, another crowd of protesters took over one of London’s iconic double-deck tourist buses and used it as a platform from which to wave “Free Tommy” banners and Union flags. One supporter, it reported, posed on top with a Donald Trump mask. Those protesters were eventually removed by police. Yaxley-Lennon, who had been convicted a year before on similar charges and had his sentence suspended, was convicted the day of his arrest of violating the court order prohibiting news coverage, as well as violating the terms of his suspension, and sentenced to 13 months in jail.